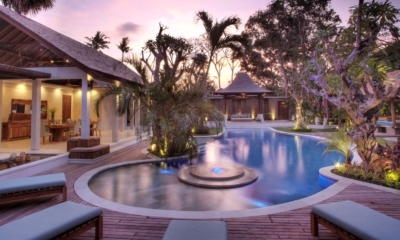 This is one oof the most sought after 4 bedroom villas in Seminyak. Villa Jajaliluna located in the Petitenget area of trendy Seminyak is a peaceful haven when you need to escape the high life, shopping and Bali’s west coast beaches. 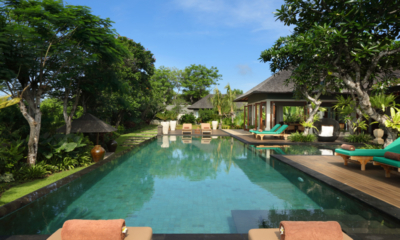 This villa comfortably sleeps 8 in its 4 spacious and luxurious bedrooms. The villa’s design takes full advantage of the calm blue waters of the private pool. The water flows right up to the edge of the three separate pavilions, linking them into a coherent whole. Relax in the lounge areas of the main building – there’s one on each of the two levels. 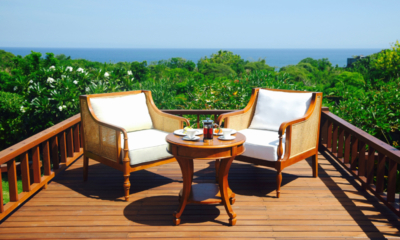 In the morning enjoy sitting on the timber sundeck which fronts the pool. Watch the shadows of the sweet scented frangipani dance on the surface of the water, or better yet, have a swim. When evening falls be sure to take your seat on the upper balcony overlooking neighbouring rice fields to enjoy your front row seat for the Balinese sunset show. When it comes to entertaining, you’re spoiled for choice. Have cocktails in the comfort of the poolside lounge pavilion before stepping across to the formal dining pavilion for dinner. The white design of Villa Jajaliluna is fresh and bright. 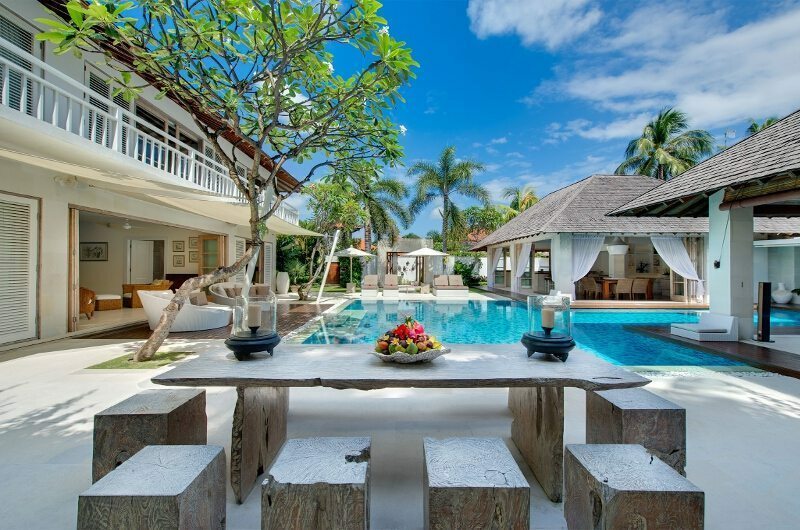 It’s the perfect holiday villa in the heart of Seminyak. Walking distance to shops, bars and spas it really ticks all the boxes. Plus has a great kids bunk bedroom for the little ones.